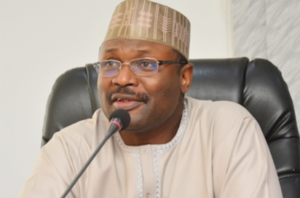 ABUJA â€“ The political pressure group, Nigerian Comrades for Atiku, NC4Atiku 2019, has warned the Chairman of Independent National Electoral Commission, INEC, Professor Mahmood Yakubu not to allow what happened during the Osun state governorship election to repeat itself during the conduct of next yearâ€™s general elections, particularly the presidential poll. The leadership of NC4Atiku 2019, weekend stormed the INEC headquarters in Abuja, where it submitted a letter to Professor Yakubu, warned that the group and entire Nigerians will never accept a repeat of Osun poll in the 2019 elections. The group therefore demanded for transparent and unbiased in the conduct of all electioneering processes in order to birth credible, free and fair elections that would be acceptable to Nigerians and the international community. The National Coordinator of the group, Comrade Efe Feludu, who led the other members of the group to deliver the letter which a copy was made available to Sunday Vanguard in Abuja, also asked that INEC must conduct credible election in order to justify the huge budget approved to the Commission. According to him, â€œWe want to use this medium to condemn the broad day light robbery of the Ekiti and Osun States peoplesâ€™ choice of governors. Just at the very moment INEC was redeeming its battered image after Ekiti State election with Osun state election, which were already concluded and adjudged to be credible, free and fair by observers, INEC decided to declare the election inconclusive. â€œThis, we and the entire Nigerians will never accept in the 2019 elections. We are therefore calling on your office to ensure all the stated observations and what Nigerians suffered from in your recent period in office are corrected and the huge fund allocated to your commission are judiciously used to give Nigerians credible, free and fair elections that will even be free from judicial manoeuvre.